Since January, I've been teaching a sewing class at my local library and this summer we did a Quilting 101 series where I taught three installments for learning how to quilt. Last week was the last class and we did binding. The students learned how to buy fabrics, sew a 1/4 seam, baste a quilt, quilting using a walking foot and trying out free motion, and then finally cutting and applying the binding. It was great seeing everyone's excitement with a finished quilt! 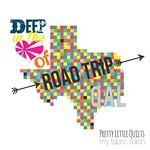 Hopefully I spread the quilting bug a little! I, too, made a quilt as a demonstration quilt and I am so happy to have it finished. It's so hard to put something away for a month especially when all it needed was binding...haha! I didn't have any one in mind for this quilt when I made it and since it's baby size, I thought I would give selling a try. This is my first quilt to sell and might be my last. I would consider it gender neutral with just enough of every color to make any new mother happy. I used two charm packs for the quilt, one being Summerville by Lucie Summer for Moda and then a coordinating solids charm pack. The back is a turquoise print from the Summerville line and the binding is Sketch in Cherry by Timeless Treasures. The quilt measures 35 x 40 inches (prewashed). Quilting is a done in a wavy vertical pattern using Gutermann thread in natural and the binding is attached by machine for durability. I absolutely love this quilt and would keep it if it was a tad bit bigger. Thanks for visiting and wish me luck! 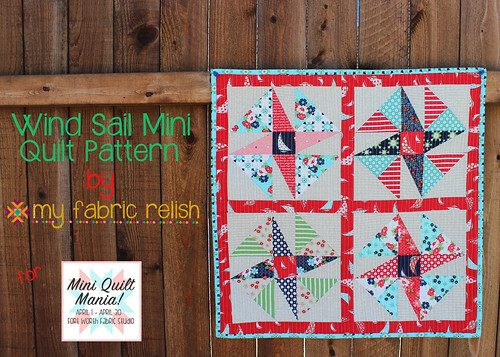 If you are interested in purchasing this quilt, please feel free to email me at myfabricrelish@gmail.com. 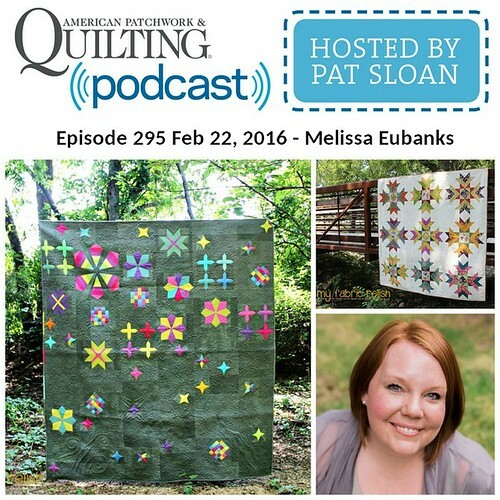 Linking up with all my buddies on the right and Crazy Mom Quilts! Looks lovely! I like the mix of solids a lot - very nice. Best wishes with the sale! Thanks so much! To be honest, I wouldn't be heartbroken if this did sell...it's hard to let them go :( I love this fabric! 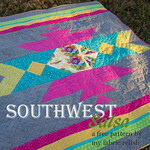 the quilt is very nice I am sure you will have no problem finding a buyer and maybe get more orders too. Lucky girls to have lessons from you, I have still to have a go with my walking foot, I must draw up a list of things as I forget what I want to try old age to blame ! Thanks Margaret! I've enjoyed teaching these ladies how to sew and quilt! 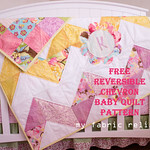 Ive created some new fabric addicts and hopefully quilters and that makes it more fun! Don't know about orders...that might take the fun out of it...hahaha! Thanks for the visit! What a sweet quilt! Hurrah for you for teaching that class and spreading the quilting love. Thank you so very much! It's been great fun teaching something I'm so passionate about! I love it! I would have never picked some of those fabrics to go together but the end result is awesome! 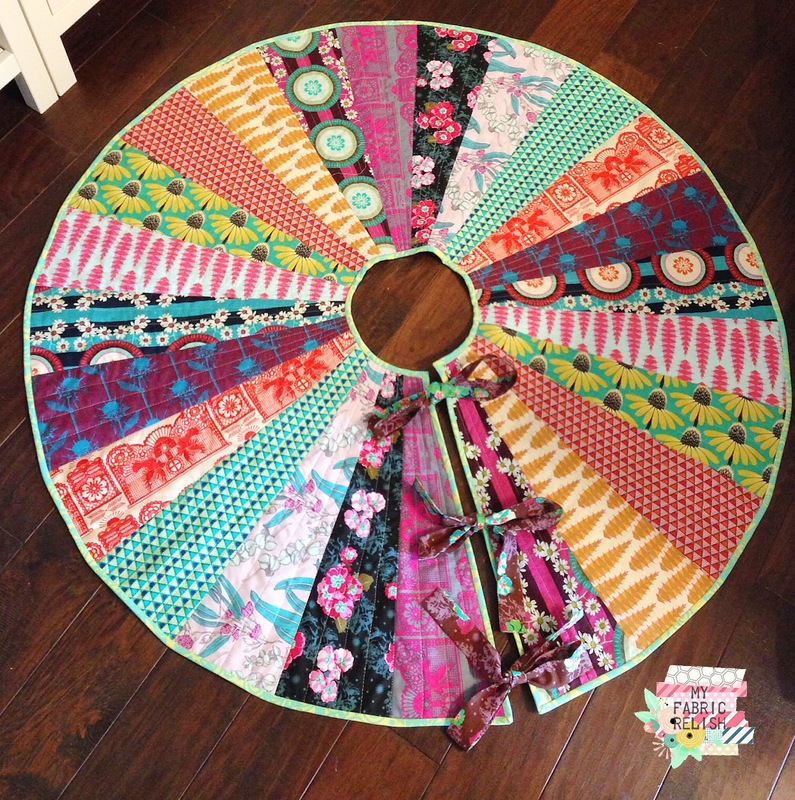 Such a fun and fresh quilt, Melissa! Great job! Thank you!!! I hope I find it a good home. Thanks for visiting and have a great weekend! 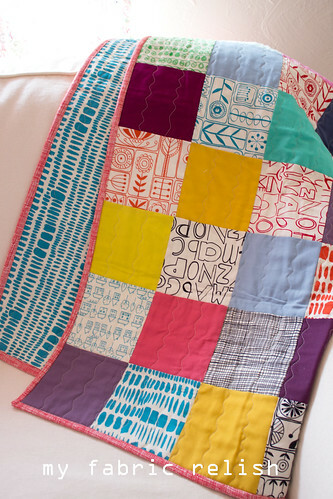 This a great modern baby girl quilt! Beautiful finish! Thank you, Janet! I'm so pleased with it and that its finished. Thanks for reading and leaving a sweet comment! 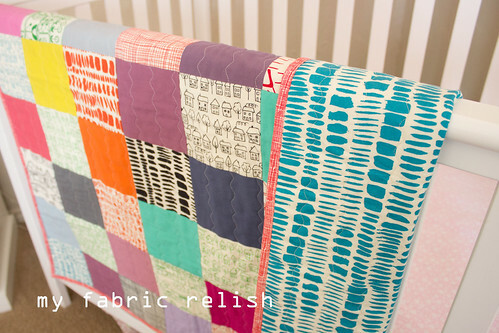 Adorable cozy Relish baby quilt! Love the colors and little prints! That is so great that you taught a class! Especially on how to buy fabric! Because that is in my opinion the most important part! Thank you so very much, Debbie! I bought these fabrics together not even planning that they would be put together. So funny how that happens. I really love teaching my sewing class. I've had several ladies go from never owning a sewing machine to quilting in just a few months. So exciting! And I agree with you about how to buy fabric. That is sometimes the hardest and most time consuming part! 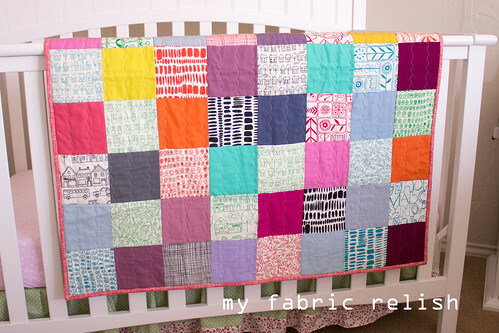 This is a great quilt and I bet it will sell in a snap! Love the binding on it and I really want to try that quilting on one of my own. Thanks, Paula!! I still need to officially list it on etsy, but secretly hoping a friend or acquaintance on FB buys it first. Keep it somewhat close by. Lol. 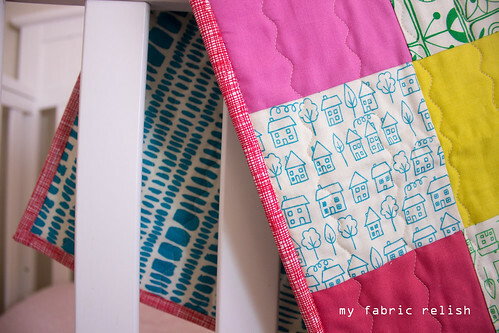 Oh, and this quilting is so easy, fast, and fun! Looks cool too! 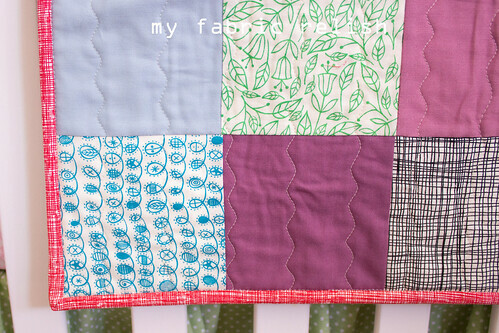 That is one very adorable baby quilt! Love that it gender neutral!!! Thank you Esther! I hope it finds a good home! Thanks also for visiting and leaving a dear comment! 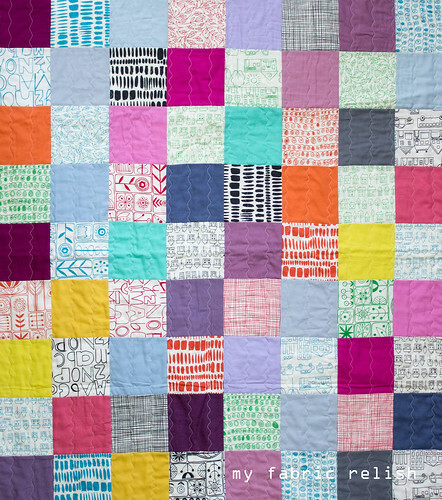 Great quilt and great job spreading quilty fever! I hope I'm contagious! I need partners in crime! Lol. Thanks for visiting and leaving me a sweet comment!